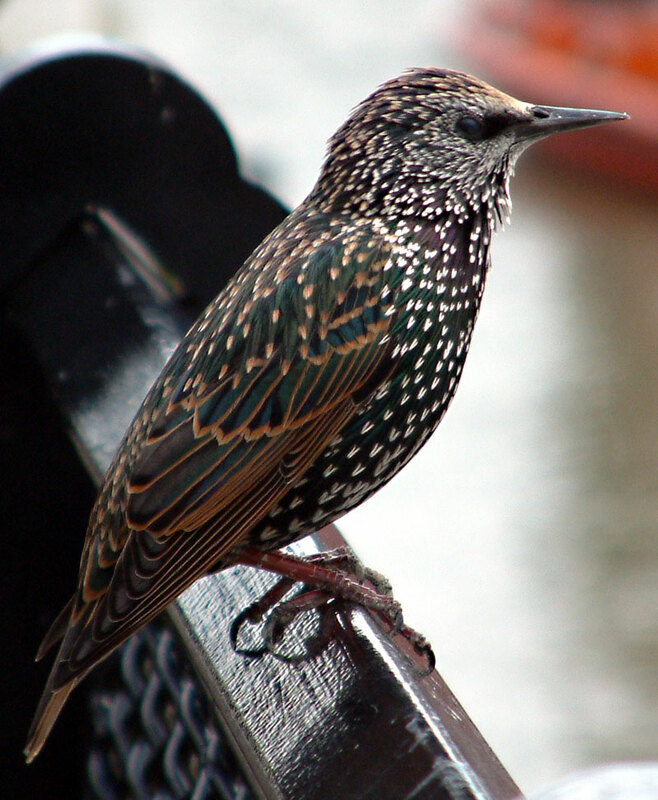 European starlings are an invasive pest species introduced to the United States in 1890. Rumor has it that one hundred starlings were released in Central Park in hopes that all of the birds mentioned in Shakespeare's works would become established in the New World. In the case of the starling, the wish became reality. In the intervening hundred years the starling population has grown to an estimated 150-200 million birds. They are small black birds with an iridescent green and purple gloss on their feathers. The tips of the feathers are cream colored and create a characteristic "flecking" effect. In winter these pale tips erode away exposing the deep purple gloss on the nape, cheeks and throat of the breeding male. During the winter the male also develops elongated breeding plumage on his breast. His back, flanks and rump become a deep iridescent green. European Starlings can carry diseases that are transmissible to livestock and to people, including TGE (transmissible gastroenteritis - a disease of swine), blastomycosis, and samonella. One study found that European Starling droppings contained C. jejuni, L. monocytogenes and C. psittaci, all human bacterial pathogens. The study concluded however, that starling droppings were not a significant source of human infection (Gautsch et al. 2000). In the United States, starling droppings provide a growth medium for Histoplasma capsulatum, the fungus that causes histoplasmosis in humans. All of these examples indicate that the spread of disease by starlings to humans and livestock is a potential threat. Spread of disease among wildlife is another facet of this problem. 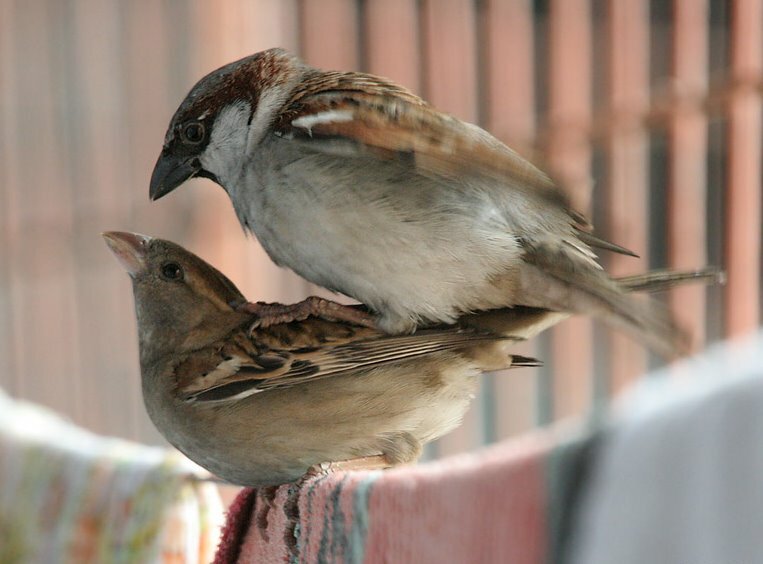 The House sparrow is the number two urban pest bird. Introduced as a species to North America, the house sparrow quickly spread across the country due to its lack of natural enemies and its adaptive traits. Its ability to nest in urban structures, eat urban scraps and a large breeding capacity are some of these adaptive traits. The House Sparrow is actually a member of the weaverbird family and not a true Sparrow. Weaverbirds create intricate nests and relative to their size, the largest nests in the bird world. Their legs and toes are favored for branch perching and their short conical bills are ideal for seed cracking. Their diet consists of seeds and grain, as well as fruits, vegetables, human table scraps and insects. They are boisterous, intelligent birds who roost in noisy flocks on branches of city trees, ivy covered walls and under eaves of houses. Male House Sparrow have black throats and chest patches, light cheeks and brown nape. The female has a plain brownish chest and dull eye-stripe. They are often a nuisance in urban areas like manufacturing and food processing plants. Gutters and drainage pipes clogged with sparrow nests can backup and cause extensive water damage and fires have been attributed to electrical shorts casued by machinery housing sparrow nests. Lastly, feces buildup can lead to structural damage from the uric acid in droppings, plus the bacteria, fungal agents and parasites in the feces also pose a health risk. Feral pigeons, also called city doves, city pigeons or street pigeons, are derived from domestic pigeons that have returned to the wild. 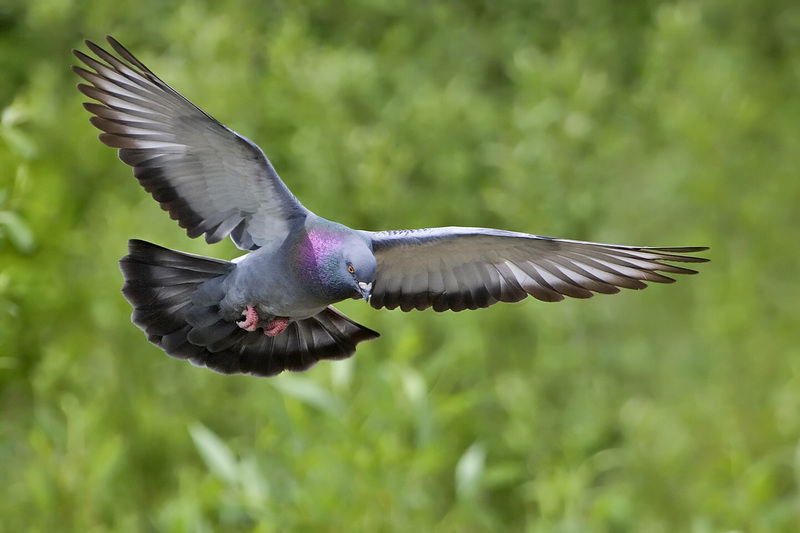 The domestic pigeon was originally bred from the wild Rock Pigeon, which naturally inhabits sea-cliffs and mountains. All three types readily interbreed. Feral pigeons find the ledges of buildings to be a substitute for sea cliffs, and have become adapted to urban life and are abundant in towns and cities all over the world. On undamaged property the gutters, window air conditioners (especially empty air conditioner containment boxes), chimney pots and external ledges will be used as nesting sites. Many building owners attempt to limit roosting by using bird control spikes and netting to cover ledges and resting places on the façades of buildings. These probably have little effect on the size of pigeon populations, but can help to reduce the accumulation of droppings on and around an individual building.